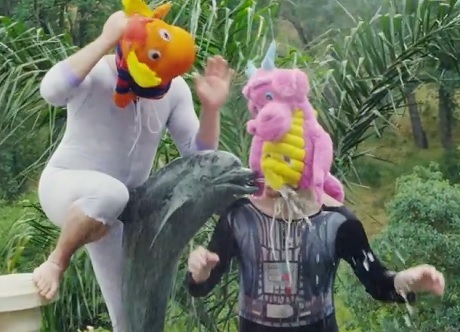 Tera Melos have made a habit of delivering some out-there videos supporting last year's X'ed Out, and the Sacramento trio have come through yet again in the clip for "Slimed," which presents one hell of an uncomfortable pool party. It all starts in a shower, though, where musicians in makeshift stuffed animal masks decide to have an acoustic jamboree. From there, the gang gets goofy, whether jumping into a luxurious looking pool, riding marble dolphin statues or playing games in a garden. Unsettling as the artsy, herky-jerky noise rock explosion it supports, you'll find the video down below.